Elaborate, yes, with much thanks to CAD and the pliability of digital (drawing) data in general. The database itself in now over 7MB which, for my 17 year old ARRIS CAD system, is rather large and getting cumbersome. Next steps are plan development of the 'grid iron' sections, and overall development of the plan in 3D. I also see Campo Rovine developing along 'parametric' lines. "In the process of demonstrating the open-endedness of architecture's self-reflective dialectic as well as its fictitious beginnings, Eisenman analytically "read" a series of architects throughout his career, whose structures would disintegrate into radically self-contradictory configurations in the process: Andrea Palladio, Giambattista [sic] Piranesi, and Giuseppe Terragni were his main critical templates to corroborate that the discipline had always hinted at an awareness of its paradoxical foundations; the critical dimension of architecture was just less subdued with these architects, and hence their analyses released the whole (ironic) critical-constructive paradoxes of architecture. 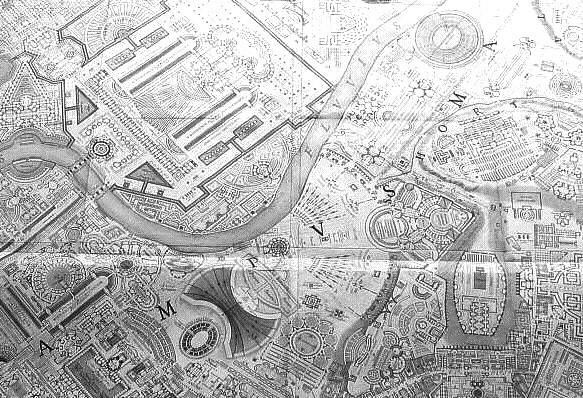 For example, in his etchings for a map of the Campo Marzio dell'antica Roma from 1762, Piranesi had proliferated the classical compositional logic of architecture to a point where his two-dimensional plan could no longer correspond to the three-dimensional ideal of a "classical" urban space; Piranesi had created a formal hyperbole out of the accepted rules of classical composition only to demonstrate the logical collapse of these very rules. Piranesi "concretized" the idea of language's sublime open-endedness into a physical reality that took on characteristics of the grotesque: "Whereas the sublime deals with qualities of the airy, qualities which resist physical occupation," Eisenman argued, "the grotesque deals with real substance, with the manifestation of the uncertain in the physical." With Piranesi, classical architecture used its own mechanism for self-annihilation--in a sense, it "swallowed its own stomach." 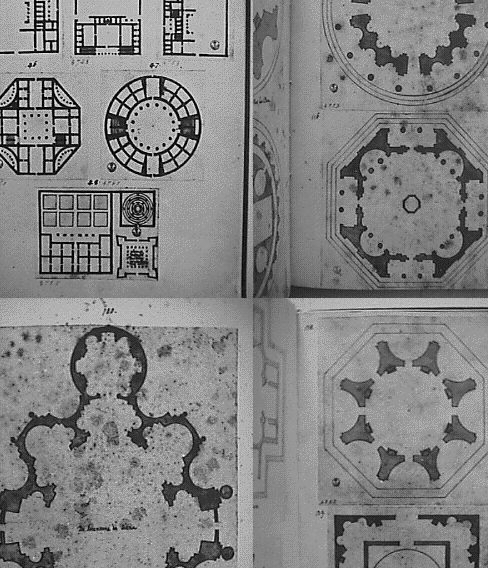 Alongside Piranesi, Eisenman also made Palladio and Terragni into demonstrations of the breakdown of the established architectural canon at their respective moments in time. He rhetorically fleshed out their formal "disturbances" in the accepted compositional standards of architecture and propagated them ad nauseam into self-contradictory diagrams of formal fragments. Once again the temporal dialectic of postulation and refutation was in and of itself materialized as "architecture."" Emmanuel Petit, Irony or, the Self-Critical Opacity of Postmodern Architecture (New Haven: Yale University Press, 2013), p. 175. 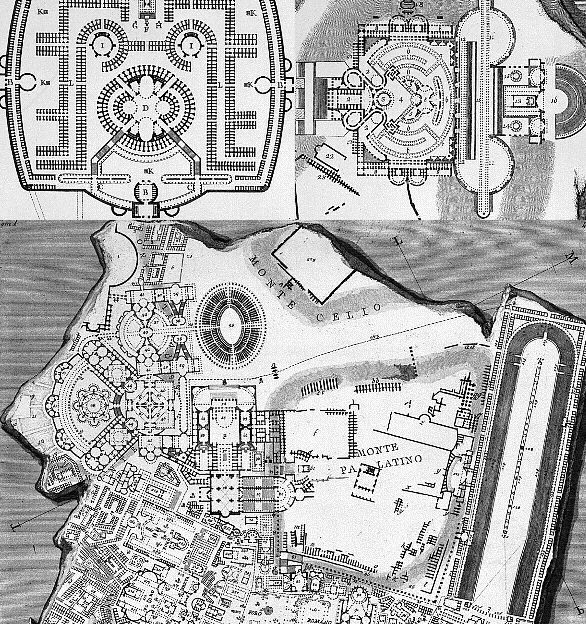 Petit's explanation of Eisenman's analysis of Piranesi's Ichnographia Campus Martius is really only a paraphrasical reiteration of Tafuri's critique of the Campo Marzio plan. Furthermore, Eisenman's quote regarding the sublime stems from a text that has nothing directly to do with Piranesi and/or the Campo Marzio plan. 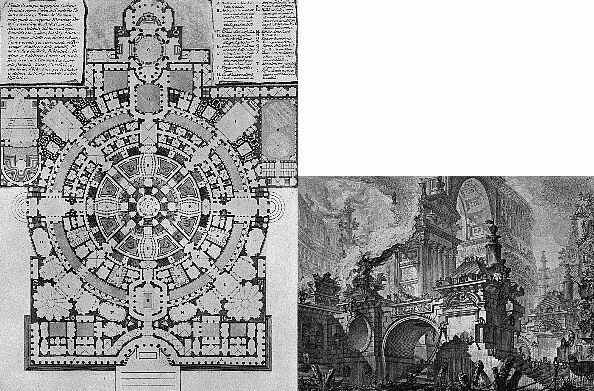 What is "the classical compositional logic of architecture" and how exactly did Piranesi proliferate the classical compositional logic of architecture?" 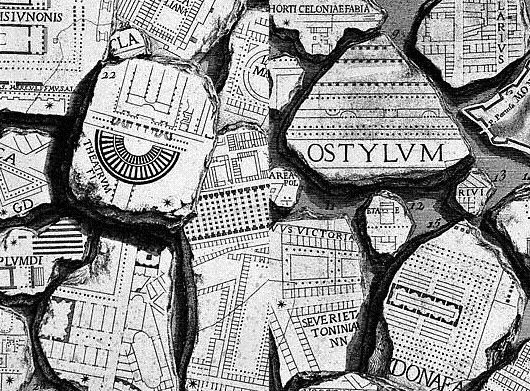 What is "the three-dimensional ideal of a "classical" urban space" that Piranesi's two-dimensional plan could no longer correspond to? If Piranesi did indeed create "a formal hyperbole out of the accepted rules of classical composition," then how exactly did he then simultaneously "demonstrate the logical collapse of these very rules?" Once again, it is really only Tafuri who ever attempts to substantiate the above claims regarding what Piranesi supposedly did via the Campo Marzio, yet even Tafuri's 'evidence' does not rightly correspond with what is actually present within Piranesi's large plan. "I am rather afraid that parts of the Campus which I describe should seem figments of my imagination and not based on any evidence: certainly if anyone compares them with the architectural theory of the ancients he will see that they differ greatly from it and are actually closer to the usage of our own times. But before anyone accuses me of falsehood, he should I beg, examine the ancient [Marble] plan of the city . . . he should examine the villas of Latium and that of Hadrian at Tivoli, the baths, the tombs and other ruins outside the Porta Capens and he will find that the ancients transgressed the strict rules of architecture just as much as the moderns. Perhaps it is inevitable and a general rule that the arts on reaching a peak should decline, or perhaps it is part of man's nature to demand some licience in creative expression as in other things which we sometimes criticise in buildings of our times." Thus, following Piranesi's lead, the investigation commences. Hadrian, Hadrian's Villa (Tivoli: AD 118-125). 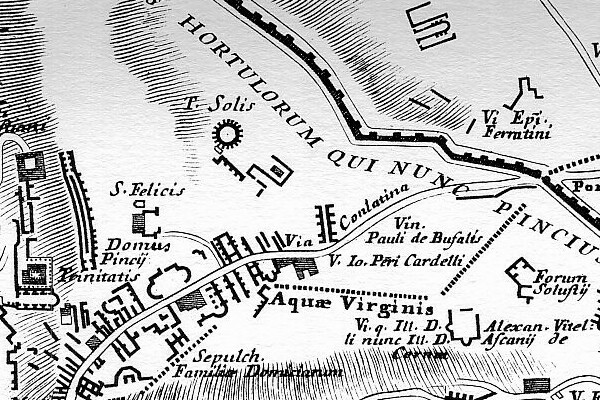 Septimius Severus, Forma Urbis Romae (Rome: c.195). Leonardo Bufalini, Urbis Ichnographia (Rome: 1551). Giorgio Vasari the Younger, La città ideale: piante di chiese [palazzi e ville] di Toscana e d'Italia (1598). 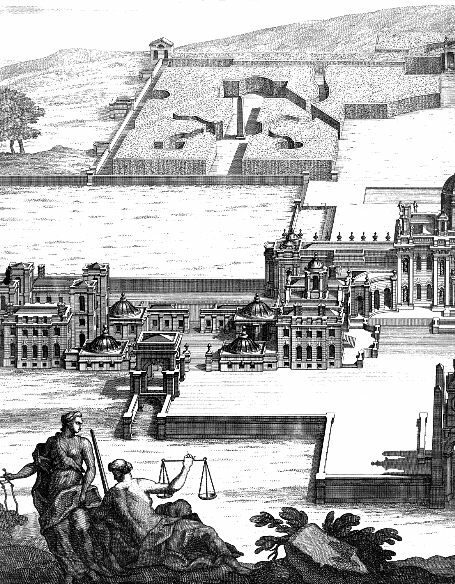 Colen Campbell, Vitruvius Britannicus (London: 1715-25). Giovanni Battista Piranesi, Opera Varie di Architettura (Rome, 1750). Giovanni Battista Piranesi, Le Antichità Romane (Rome: 1756). Giovanni Battista Piranesi, Ichnographia Campus Martius (Rome: 1757-61). 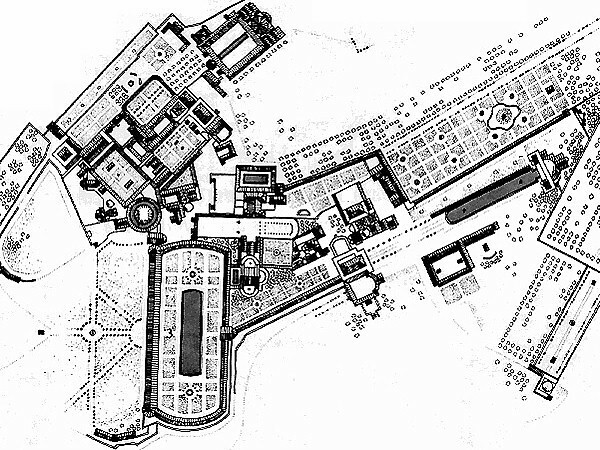 Vincenzo Fasolo, "The Campo Marzio of G. B. Piranesi" (Faculty of Architecture at the University of Rome, 1956). Quondam, Ichnographia Ink Blot (2008). Quondam, Karastan (New Not There City: 2013).